The large hill behind our house was the site of a skirmish in the French and Indian war. Five stone cairns form a circle that may, possibly, mark the graves of five soldiers, casualties buried up on the hill after the skirmish (if Bicentennial speeches in dusty town histories are to be believed, and of course speeches leave out necessary details of exactly where graves are). 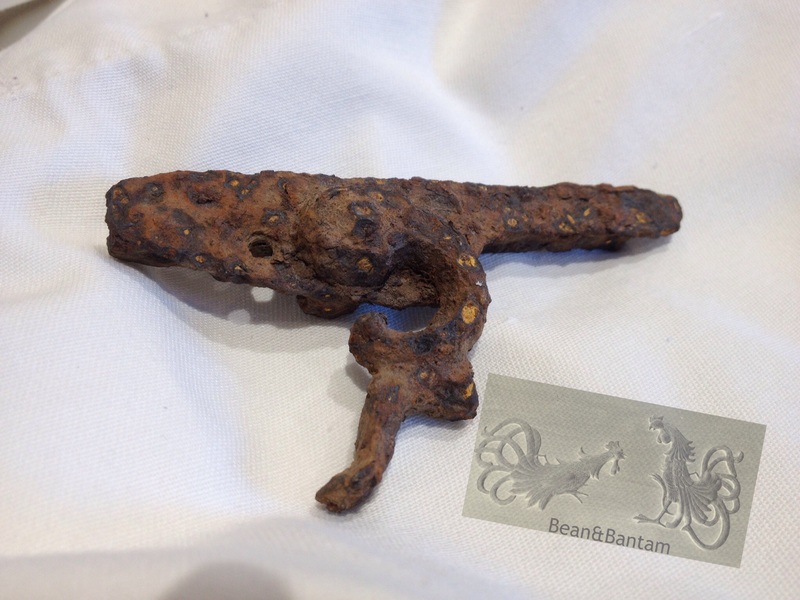 When we first moved here, I dug up a flintlock out of the earth in the back yard, at the foot of that large hill, and I became curious as to why an old gun might have been left on our land. Was there blood shed on the ground that we now swing lazily in a hammock over, that we play on, that we roll over on in laughter and chase each other in fun? Were there, long ago, emotions strong enough to shed blood over? If there were, they’ve since been absorbed by the ground: diffused by the layers of time and soft silty earth, erased, unseen below the grass we now walk on, and no longer felt. Actions and consequences which, once upon that time, must have cut sharp now have blurred edges, uncertainties. And like those casualties of that long ago skirmish, no one survives from that time or this, all that is left, or will be left, are words, and metal like the flintlock and horseshoes, curiously bent square nails. Perhaps some shards of pottery, and those stone cairns up on the hill. Hopefully some art, but I think probably not from our side of this remote hill. The town keeps land records, carefully bound, safely conscripted to a walk-in vault. These official records are indexed, even the earliest hand-written ones with beautiful script and hard to decipher flourishes. Those records can be followed to trace the history of our property from owner to owner in a chain of title, but not much can be gleaned but names and places, buyers and sellers, liens for debts. Court and military records may reveal more detail: transcripts of disputes, bad behavior, acts of valor. Probate court is interesting, as it contains the public record of how individuals distributed their belongings, a sort of catalog of last wishes, and how they felt about the ones they loved, and those they did not love at all. And it is something to wonder at: these many individual wishes and dreams survive, written on paper, tucked within filing cabinets, within a framework of paper and ink and steel, while the skeletons of those wishes and dreamers long ago turned to dust. Endless dusty files, distilling raw human emotion and actions into a paper realm, neatly defined by the parameters of law. Orderly documents folded into files, tucked into drawers. Wishes and dreams, so distinct to their owner but distant now, muted in yellowing paper, filed next to many others. Individual emotions don’t conscript themselves to eternity, except in the most general of ways, distilled to the universal. It’s just not possible to entirely know the history of a place, or to catalog every circumstance. History is many times in the small and personal details, and easily lost.